It looks like all of those 2018 predictions about healthcare-related distress were off by a year. Weâ€™re merely in mid-February and already there has been a full slate of healthcare bankruptcy filings. 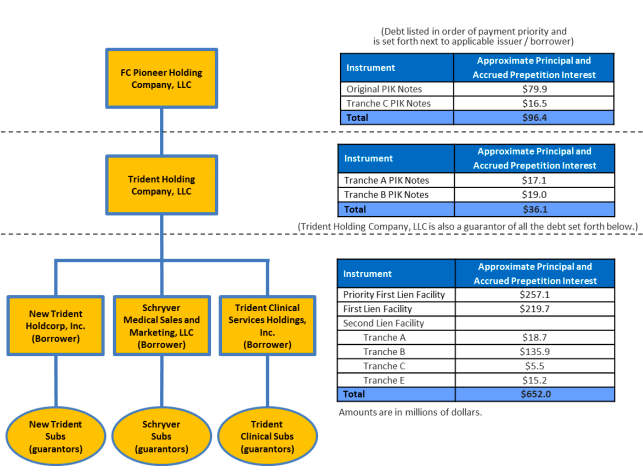 Here, Trident Holding Company LLC, a Maryland-based provider of bedside diagnostic and other services (i.e., x-ray, ultrasound, cardiac monitoring) filed for bankruptcy in the Southern District of New York. Whatâ€™s interesting about the filing is that it is particularly light on detail: it includes the standard description of the capital structure and recent efforts to restructure, but there is a dearth of information about the history of the company and its financial performance. There is, however, a restructuring support agreement with the companyâ€™s priority first lien lenders. Moreover, a number of recent customer bankruptcies â€“ including those of Senior Care Centers, LLC, 4 West Holdings, Inc., and Promise Healthcare Group, LLC â€“ have exacerbated the Companyâ€™s liquidity shortfall by limiting the collectability of amounts owed from these entities. A number of other customers who have not yet filed bankruptcy cases are generally not paying the Debtors within contractual terms due to their own liquidity problems. As a result of these collection difficulties and challenges with the new billing system in the Sparks Glencoe billing center, the Debtors recorded $27.8 million of extraordinary bad debt expense in 2018 and $12.7 million in 2017.
â€¦a â€œdeath trap.â€� That is, if they accept the plan theyâ€™ll currently get â€œ [â—�]%â€� but if they reject the plan theyâ€™ll get a big fat donut. Likewise, the second lien holders. General unsecured claimants would get a pro rata interest in a whopping $100k. Or the equivalent of what Skadden will bill in roughly, call it, 3 days of work?? Trident has suffered ripple effects from the distress faced by skilled nursing facilities (â€œSNFâ€�), which are its primary direct customers. SNF occupancy rates have declined to a multi-year low as a result of structural and reimbursement changes not yet offset by demographic trends. These structural changes include, among other things, patient migration to home health care. The decline in SNF occupancy rates has led to reduced demand for Tridentâ€™s services. At the same time, Trident has only had limited success reducing costs in response to lower volumes, as volume declines are driven by lower utilization per facility rather than a reduction in the number of facilities served. This is a trend worth continued watching. Who else â€” like Trident â€” will be affected by this? Large general unsecured creditors of the business include Grosvenor Capital Management, Jones Day (to the tune of $2.3mmâ€¦yikes), Konica Minolta Healthcare Americas Inc., McKesson ($MCK)(again! !â€¦rough couple of weeks at McKesson), Quest Diagnostics Inc. ($DGX), Cardinal Health Inc. ($CAH) and others. They must be really jacked up about that pro rata $100k! !